This video was made in Kyoto imperial park in november (yes I know…. long time ago! We don’t find much time to edit the videos… I still have 5 other ones waiting to be edited!). 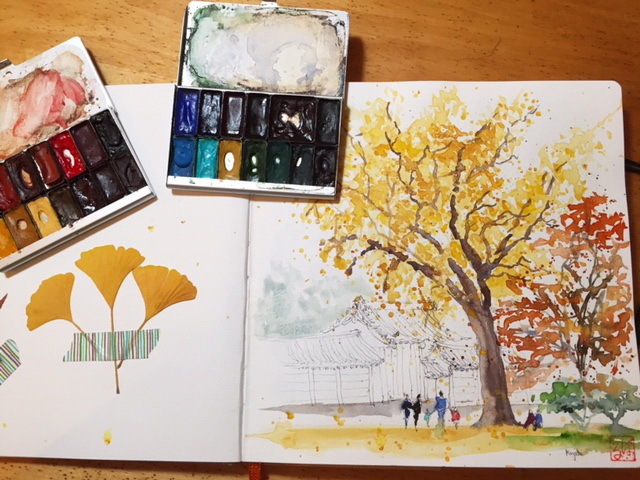 I wanted to paint the beautiful gingko trees. The Japanese are crazy about the wonderful autumn colors. These trees are incredibly yellow, and the mixture with the orange maple trees is gorgeous. So I started immediately with the yellow of the main tree in the scenery and I’ve built the rest around it. I used two Escoda synthetic Perla travel brushes and two sable travel Brushes of the brand “Rosemary’s and co” : a rigger and a diagonal brush. This diagonal brush is handy because you can use it flat or just with an incredible fine tip like the rigger. So I started immediately painting the yellow ginkgo leaves to set the overall shape of the main tree. For this yellow I used light Ochre (Winsor & Newton). After the overall shape was set (don’t fill everything up : leave white paper to suggest the leaves) I have painted a quick brushstroke under the tree to suggest the ground filled with dropped leaves in the same ochre color. The repetition of the ochre color on the ground will link the scenery in your lay out. After that I started to draw the branches and the trunk with a fine ball point pen. Don’t draw continuous branches: some branches go in front of the leaves and some are interrupted by them because they’re behind the leaves. Afterwards I drew the Imperial Palace walls behind the tree. I will leave them without color because they’re not the main subject of this sketch. The main subjects are the trees and the people enjoying the autumn. This is not no man’s land: sketch also some people to have human activity in your sketches and to show the scale of the scenery. The orange of the maple tree next to the ginkgo will add warmth. Finally I add some dark ochre splashes to give volume to the tree, and the colorful clothes of the people make the sketch come alive. Don’t forget some dark shadows in the branches and the tree trunk. Happy sketching everybody ! Feel free to comment or ask questions. It was sheer delight watching you sketch this beautiful Fall scene. I love how you did this little loose sketch, Barbara! It was interesting for me to see how you used that diagonal brush. It’s always nice to see how a sketch is ‘born’ , so sponatenous and great . Love the sketch! I lived in Japan many years ago and loved it this beautiful country. You did not look tired. Thank you! Thank you very much for sharing this sketch, it seems so easy and of course it’s not! I like the way you made the foliage in a very free style before drawing. I really enjoyed your video. I have two Pocket Palettes also but never thought about bringing them both along. Why not? Who knows? Thanks for this idea. Beautiful painting, beautiful painter! Thank you for the inspiration – for making the video. The loose, relaxed style is something I am trying to get to. Thank you so much Ellen !! !